"Old Hickory Sheds is The Premier Builder of Portable Buildings, Sheds, Barns, Cabins and Storage"
Old Hickory Sheds has three factories in Oregon, three in Washington, one in Idaho, two in California, two in Montana and one in Wyoming. Old Hickory can easily deliver an Old Hickory Shed, Lofted Barn, Cabin or Garage directly to your Home or Business and it's really easy ... all online ... Just send an email with your name and the delivery address and we'll email you our 8-page color eBrochure with the styles, sizes, options and prices to Buy or Rent-To-Own and the cost to deliver if any. Skids are 4"x6" not 4x4s and are notched and pressure treated. Floor joists are 2x4s, pressure treated, 16" on center and set into notched skids to prevent twisting. 12" centers and 2x6 floor joists are available. Floor decking is 5/8" inch tongue & groove plywood flooring. 3/4" flooring is available. Wall studs and Roof Trusses are 24", 16"
or 12" on center depending on the snow load rating you select. 30 year architectural shingles or 29 gauge metal roofs are the same price. There are a variety of different shingle and metal colors for you to choose from and we can match an existing color. All siding is 1/2 inch real T1-11 exterior plywood not LP. All exterior trim is 1" solid cedar. All sheds come with locks and keys. 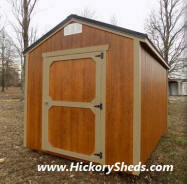 Sheds are water sealed with Olympic Magnum oil base stain and sealer ... The color is Honey Gold. 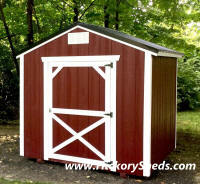 Our highly skilled work force use Mennonite craftsmanship on every shed. 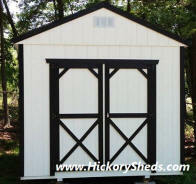 If you see a shed you like, but want to add more options, remove an option, or move standard features, let us know. We can do it! 5 Year Fix It All Warranty: There is no need for a lot of details about the best warranty in the business. That's because we fix it all in the first five years (normal wear and tear excluded) free of charge. Any flaw or defect that is a result of materials or workmanship which occur during the first five years you own the shed will be repaired by us. That's right, we stand behind our product 100% and you won't find that anywhere else. On all pressure treated wood, there is a lifetime warranty against termites and fungal decay. Three snow loads are available 30 PSF, 60 PSF and 140 PSF along with stamped engineered plans. 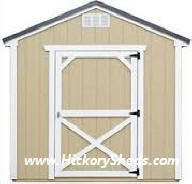 The Utility Shed features a gable roof and it comes with inside wall height of 6' 3" or 7' 8"
The 8’ wide models have a single barn door while the larger models have double barn doors. Available in Widths of 8', 10', 12', 14 and 16'. The Single Barn Door opening is 45" wide and 70" tall (6' 3" walls) and 77" tall (7' 8" walls). The Double Barn Door opening is 68" wide and 70" tall (6' 3" walls) and 77" tall (7' 8" walls). #42 How about a 14'x40' dog kennel?